Choose your length of cleanse, and also choose how deep you’d like to venture into the land of body purification. Kim can help guide you through a journey of wellness at your pace and tailored to your personal needs and lifestyle. Today’s lifestyle is hectic. It can be daunting to think about changing your life to such a degree that you would lose your work-life-family-life balance. Having someone else take care of your meals is half the battle, and having someone to guide you along the way makes it doable. This cleanse includes consultation with Kim Vidya, infrared sauna to help with the detox, meals, and unlimited yoga classes during your cleanse. You may purchase your cleanse in person at our Elixir Bar at Vidya's, or online here below. When purchasing online please print and bring your PayPal receipt with you and contact us to reserve your initial consultation. Connect with your Higher Self, Inner BEing, Unconscious Mind, Spirit Guides, Angels and the Divine. Intermediate & Advanced Level Discussions for people who have foundational understanding on; Energy, Chakra, Aura's and other Metaphysical Topics. This Meditation Journey is in alignment with the current astrological configurations. Planetary alignments which create energetic pathways to what we are experiencing on a personal and transpersonal level. Whenever we have something that transpires in life it is believed to be due to the planetary alignments and activations that are taking place. Before the meditation journey, I will describe the energy of what is happening in the universe and how that energy is currently impacting us. This gives you the ability to reflect upon your daily, weekly or monthly activity and relate to what you are learning on a personal or spiritual level, which integrates self-awareness, healing and inspiration. During the meditation I hold an intention and create a sacred space for everyone participating which allows for safe and easy access to your Higher-Self and your unconscious mind. After the meditation, everyone is welcome to share their experience and if you do you will receive insight into your personal experience and symbolism within your meditation as it applies to you specifically and what you may be experiencing now. Join me into gaining insight, clarity, peace and the tools to BEing and feeling aligned within the Self through these Guided Mediation Journeys. Registration: Please contact Nancy Arruda directly through FB messenger, call or text 905-717-1452 or email. Have a suggestion for a cuisine to be featured? Email us now. Day Retreat includes gentle restorative yoga using heated stones and warm sandbags, reiki healing with Lisa Dattoli followed by a 3-course organic and plant-based meal at Vidya's Veggie Gourmet! Register online via Paypal or in studio. Email for questions. *Limited to 12 participants. 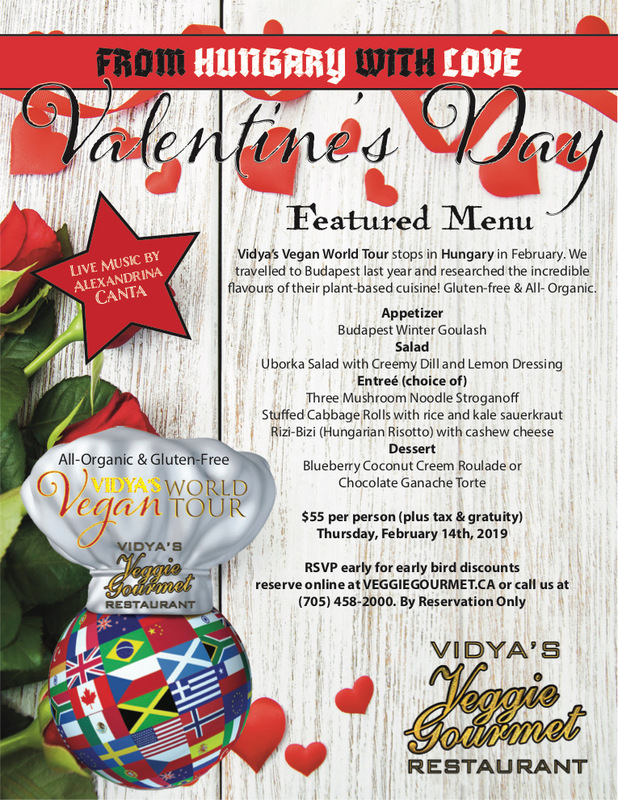 Workshop includes 20% off your meal at Vidya’s Veggie Gourmet! Our event was such a great success that we have decided to offer Babaji’s Kriya Yoga as a regular monthly event! Workshops will be 90 minutes in length with option to join us for dinner at Vidya’s afterwards. *If you are interested in this course but this time doesn’t work for you, please let us know so that we can plan other times for future classes. The practice of yoga is an art and science dedicated to informing us of the union of Body, mind and soul. Its objective is to offer a roadmap to the practitioner reaching their full potential in this lifetime. In short it is about making balance and creating equanimity so as to live in peace, good health and harmony with the greater whole. This art of living is the foundation and yoga philosophy was formulated into a text called The Yoga Sutras in 200 AD. This sacred text describes the inner workings of the mind and provides an 8 step blueprint for controlling the restlessness of the human monkey mind so that we can enjoy a more peaceful, joyful life. This half day course will teach the basics of this philolosphy and ideas so that we can bring these teachings into our daily life and enjoy the fruits of our efforts in the process. Please register online through our yoga schedule registration page. Friends or lovers! 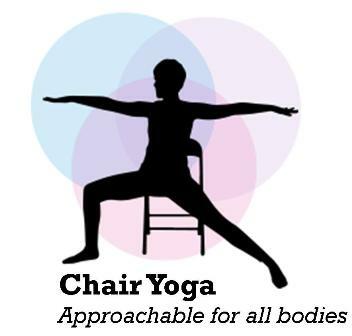 Join us for a 1 hour gentle yoga class with a friend or partner! YogaStone Restorative class from 5:30 - 6:40 pm followed by a delicious all Organic meal at Vidya's Veggie Gourmet! Price Includes Yoga class for two, Soup of the day/corn bread + Entree of Choice. *please note package does not include server gratuity. Any upgrades to entree meals are extra, and alcholic/non alcoholic beverages are extra. *If you prefer to pay for the class and meal separately this is also an option. Class would be $18 per person, plus whatever you order individually. 5th Anniversary at Vidya's Veggie Gourmet! CAN YOU BELIEVE WE ARE FIVE!? Join us for a meal on our anniversary and receive a very special gift bag filled with coupons, free gifts, and savings at The Vidya Centre For Yoga & Wellness! The first 50 guests receive a gift bag filled with gifts! Free infrared sauna or 1 free when you purchase a package of 4 or 8 saunas. Free yoga class for 2 plus 20% off your meal for two at Vidya’s. Plus many other gifts and prizes from our several practitioners and services at The Vidya Centre! 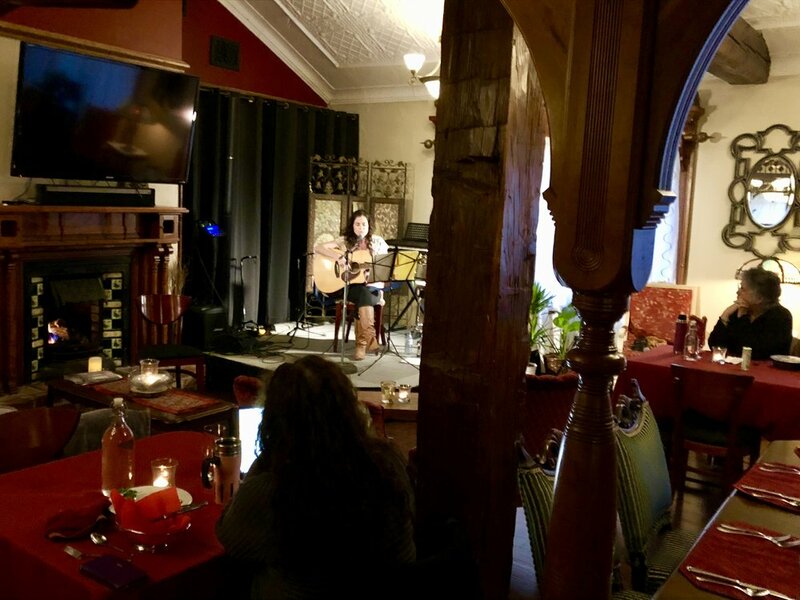 Kava Lounge Open Mic Night Live Music! A monthly women's circle meeting the first Friday of each month from 7 pm - 9 pm. $25 If pre-registerd (see below) $30 at the door. We wish to increase our circle of friends, to teach and learn from one another, and to provide a lasting sacred feminine support system. We wish for this circle to grow into a family - a tribe where you can come to feel safe, accepted and nourished. Register for the circle online here. Hope you will Join us! Join us for New Year’s Eve dinner at Vidya’s! We will offer our usual menu along with our New Year’s Eve Chef Feature available tonight only. Also available will be organic sparkling wine, along with our usual selection of organic wine, beer, cider, spirits, and our unique Kava “Unwine” for a non-alcoholic mood lift! Please reserve your table by contacting us now! Enjoy our full menu plus a special price fixed menu! A free event for all. Please register in advance through the website here. Limited to 18 participants. Please join us for our special Christmas Eve dinner at Vidya’s Veggie Gourmet after the class! By Reservation: Make your reservation now. Evening includes tasty treats by Vidya’s Veggie Gourmet and cash bar including organic wine, beer, and cider and non alcoholic drinks. Or reserve your seats by calling us! 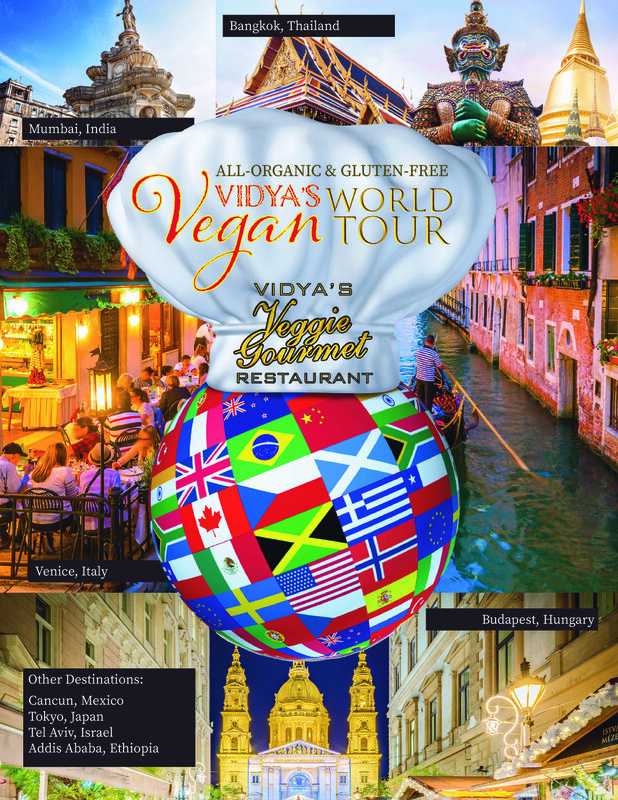 Vegan World Tour - Italy! Join mindfulness and trauma sensitive yoga teachers Brendon Abram and Kellie Dearman for a 2-day course at The Vidya Centre in Thornton, Ontario, just a few minutes south of Barrie. For questions about the course, please contact Kellie Dearman Here. Or visit her website Here. This weekend workshop is for clinicians and mental health professionals who would like to incorporate mindful movement into their practice, or yoga teachers who are interested in adapting their skills to teach a trauma sensitive style of yoga. Training is recognized as a CE (Continuing Education) credit for 14 hours. Weekend includes organic lunch at Vidya’s Veggie Gourmet! Please contact us via phone or email to register and we will take a credit card number, or e-transfer. *Overnight accommodations available on our Third floor retreat (shared/private)please call/email for inquiries. Open Mic Every Wednesday at Vidya's Kava Lounge! Seeking musicians and poets to come and share with us. Call/Email to discuss. Day includes organic lunch at Vidya’s Veggie Gourmet! All Organic, Vegan, Gluten-Free and Plant-Based 5-course menu! 6pm sitting which we will cap at 25 guests. During this event we will collect 1 message of gratitude from each guest and at the end of the night the winner will be drawn to win a very special prize! Course 1 - Shared appetizer platter including: tasty crisps with cashew cheez, onion pudla medallions, shiitake fries and kefir garlic cucumber dipping sauce. *Next Chef Feature event coming up Thursday October 18th 6pm sitting. Please contact Desiree Salis for information! $55 +hst send e-transfer here use the PayPal Link below, or drop by Vidya's Elixir bar to register! Email for questions! *NEW DATE* GRAND OPENING of Vidya's Kava Tea Lounge! Enjoy kava tea, other refreshments, samplings from our new appetizer menu, live music and friends! All are welcome. Musicans and poets wanted! Please come and play for us. This evening will kick off our Wednesday weekly Open Mic and Vinyl play nights! Bring your guitar, your voice, your poetry or your vinyl! Day includes a delicious organic meal at Vidya's Veggie Gourmet!